At the beginning of the 20th century, a half English, half Peruvian priest who grew up in Chile, went to Paray-le-Monial (France) where Our Lord Himself had appeared to Saint Margaret-Mary. This priest, Father Mateo Crawley-Boevey, had been sent to France by his superior in the hope that his health would recover from having been heavily overworked and a weak nature to start with. Father Mateo, who had a very great devotion to the Sacred Heart had always wanted to go to Paray-le-Monial, to be in the exact place Our Lord had appeared to his favourite Saint. As he was praying in the sanctuary of the apparitions of the Sacred Heart on August 24, 1907, he suddenly felt his whole being strangely moved, and not only did he find himself cured and ready to undertake his apostolic campaign, but he also clearly saw the methodical plan of the work he was to do for the Christian regeneration of families and society. He determined to take up the work outlined by St. Margaret-Mary, to organise the practice of the Enthronement, and in a crusade of love truly worldwide, to make the Heart of Jesus the King of the family, and thus extend His reign over the entire world. That same evening, on his knees, Father Mateo defined and revised the plan and ceremonial of his crusade. He then made a pilgrimage to the Holy Land were he inaugurated his apostolate of the Enthronement. 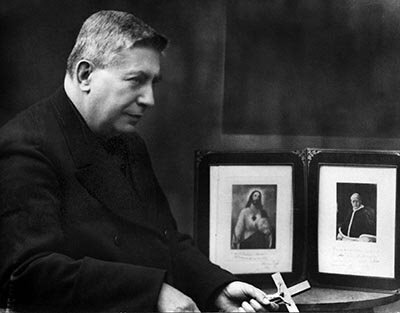 By then he had received the blessing and encouragement of Pius X, Cardinal Vives and his own Superior General. He then returned to Valparaiso, Chile, where in 1908, he launched his campaign of love, continuing at the same time his course in the faculty of law. From Chile, the Enthronement was crowned with startling success, spreading all over South America. 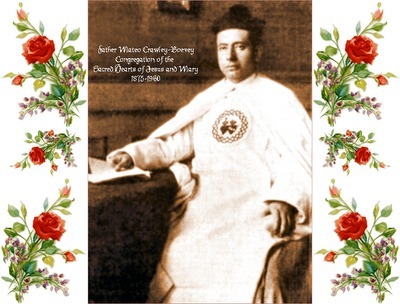 When the First World War was at its height, Father Mateo undertook to preach the reign of the Sacred Heart in France. His zeal and enthusiasms attracted crowds of people everywhere he went and a great renewal of piety resulted in many families solemnly enthroning the Sacred Heart and diocese after dioceses felt the effects of his apostolic zeal. Indifference and tepidity gave way to love, and miracles of grace were daily recorded. From France, Father Mateo went to Holland were even Protestants flocked to his lectures. 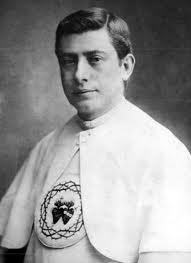 He then went on to Italy were he was received in audience by Pope Benedict XV, who requested him to preach and organise the work throughout the country. Two weeks later the Holy Father presented him with a letter written by his own hand in which he imparted his apostolic benediction on the crusade of love. For years Father Mateo crisscrossed various countries in Europe (France Spain, Italy, Switzerland, Holland, Belgium, England and Scotland, Portugal), going back and forth, giving endless conferences and retreats to bishops, priests, seminarians, Catholic associations, lay people, kings and princesses. He would give five or six talks a day, every day, in packed churches, halls, auditoriums. People came back again and again to listened to him. Thanks to his endless zeal Spain, Belgium and Portugal were consecrated to the Sacred Heart of Jesus. After 20 years of promoting the Enthronement, Father Mateo started promoting the Holy Hour in the home. He had realised, that to keep the flame of faith in the home, more was needed. Many generous Catholics, because of family obligations, distance or sickness, were not able to go to church especially at night to participate in the perpetual adoration of the most Blessed Sacrament. So Father Mateo thought he might be able to enlist them as adorers by asking them to make a holy hour in the home. Three years after starting the promotion of the Holy Hour in the home, adoration became perpetual in sixteen countries. The Enthronement is like the bricks of a building and the Holy Hour is the mortar that keeps it all together. From now on, the Enthronement and the Holy Hour in the home were promoted hand in hand. Pope Pius XI gave his seal of approval with his encyclical letter “Miserentissimus Redemptor” in which he greatly approved and encouraged both the Enthronement and the Holy Hour in the home. The Enthronement (or Consecration) as giving the proper place to Our Lord as King of society/families/countries...and the Holy Hour as expiation, to make satisfaction for our “numberless sins and offences and negligences”. Not just our offences but also other people's, to repair the honour of Christ and to promote the eternal salvation of souls. Father Mateo had always desired to go to the Far East and at long last, he was able to go to Japan with Pius XI command to “Go and preach sanctity to priests.” He spent five years of zealous and fruitful apostolate in Japan, China, Pacific Islands, Philippines, Hawaii, Indo-China (Cambodia, Laos, and Vietnam), Malacca, Macao, India and Ceylon (Sri Lanka). He then went on to the United States, arriving in San Francisco in 1940. In a letter written before his arrival, Father Mateo gave expression to the joy and determination with which he was ready to give himself “in this promising land in order to make souls love the Adorable Lover, and to spread and strengthen the Social Reign of the Sacred Heart in the home, the sanctuary of the family, the family, the rock upon which the Church builds the present and future of society.” He stayed for four years, where retreats for the clergy, days of recollection, triduums, conferences and lectures followed one another in quick succession. All the above information was taken from “Jesus, King of Love” by Father Mateo Crawley-Boeveley and The Firebrand, by Marcel Bocquet, SS.CC., The life of Father Mateo, Corda Press.